It all began in 1942, when four salesmen from Whitehead Monel Kitchen Company found themselves facing a challenge that would change the course of their careers. With steel and other resources diverted to the war effort, the metal cabinets they sold for a living were no longer in production. Rather than abandon their vocation, the four friends turned the challenge into opportunity and decided to start their own business. Together, they formed a new company and named it Wood-Metal Industries, for the two materials commonly used in kitchen cabinets. Wartime scarcities prevented them from producing residential cabinetry, so they accepted contracts to manufacture products needed by the military. Wood-Metal began operations in a small lumber mill in the central Pennsylvania town of Kreamer, turning out cooks’ tables, pigeon coops, shell cases, ladders and Signal Corps radio cases. They worked hard to develop processes that met the government’s exacting specifications for these products – especially the wood finishes. Radio cases for use in the south Pacific had to be sealed against fungus and waterproofed with as many as 11 coats of varnish to withstand extreme climatic conditions; thus was born the company’s well-earned reputation for its durable, fine furniture-like wood finishes. When the war ended and the company was finally able to undertake production of kitchen cabinetry, the company’s superb new finishes soon set the standard for the industry. Military personnel returning from the war triggered a housing market boom which continued into the 1950s, and Wood-Metal met the burgeoning cabinetry demand with an expanding product line, including a natural wood finish and 14 colorful enameled finishes. American families, looking to their roots for comfort and stability, made Wood-Metal’s knotty pine Early American Colonial-themed kitchen an instant best-seller. During this decade, Wood-Metal introduced to the market the concept of customized cabinet doors and began experimenting with mixing and matching different materials for appealing design effects. National recognition came quickly to the young company which eliminated “Metal” from its name in 1956, and became the more family-friendly Wood-Mode Kitchens. In the sixties, Wood-Mode Kitchens rose to the top of the industry, revolutionizing the way cabinetry was built with its state-of-the-art production technology and setting quality standards other manufacturers could only dream of reaching. Other manufacturers picked up on the trend, but Wood-Mode continued to lead the way with fresh design ideas and inspiring photography. In the seventies, Wood-Mode expanded the use of its cabinetry to other rooms in the home. The company introduced the concept of “RoomScaping” with a dramatically illustrated catalog showing how its cabinetry could create new and unique whole-house storage opportunities with beauty and functionality. In 1972, Wood-Mode opened its first showroom, adjacent to its Kreamer factory. In addition to displays, the building housed an auditorium that became home to the longest continuous training school in the industry. Here, independent designers from across the country have been trained in the use of Wood-Mode’s versatile and extensive line of custom cabinetry options to fulfill the dreams of their clients. In 1982, as Wood-Mode celebrated its 40th anniversary, the kitchen market exploded. Americans were feeling confident, real estate was booming, and owning a custom kitchen became an expression of one’s status and lifestyle. With the focus on premium quality and craftsmanship, Wood-Mode was perfectly positioned to serve the growing demand. In 1984, Wood-Mode introduced Design Group 84 – an innovative frameless line of custom cabinetry. This new line, long a staple of European cabinetry construction, quickly found popularity and further established Wood-Mode as the design leader of the industry. 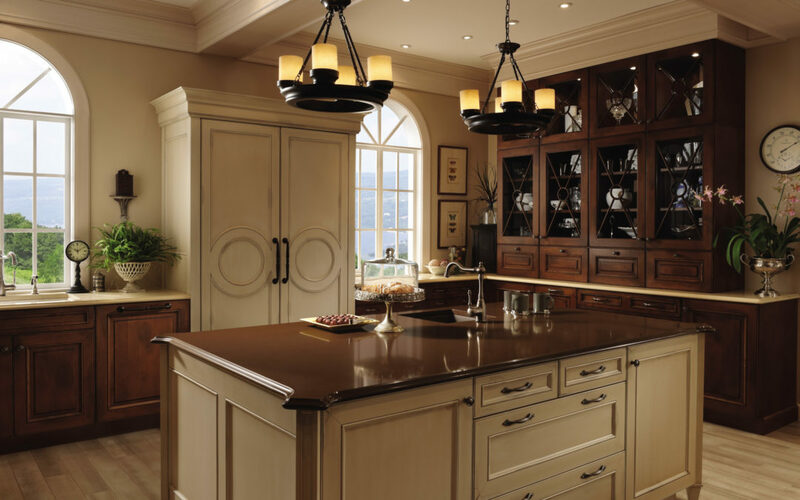 In the late 1980s, as the custom kitchen market continued to expand and broaden its appeal to an increasingly larger number of homeowners, Wood-Mode responded by introducing Brookhaven, a limited-custom line of cabinetry, which made Wood-Mode quality and craftsmanship available to an even wider range of customers. Wood-Mode made numerous improvements to its Kreamer factory during the 1980s, not only to accommodate its increasingly diverse product line but also to assure that its manufacturing process remained consistent with its care and concern for its employees and the environment.